Discover the historic monuments, lively souks, and architectural landmarks of Dubai while traveling at your own pace on this private tour. Explore the Bastakiya district of Old Dubai, enjoy photo stops at Fort Al Fahidi and Jumeirah Mosque, browse the Gold and Spice Souks, and cruise across Dubai Creek on a traditional Abra boat. 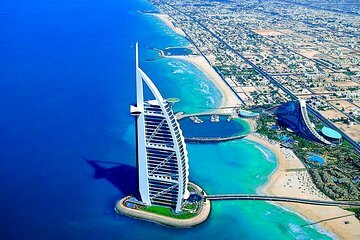 End the morning with a delicious lunch at the luxurious Burj Al Arab hotel, located along Dubai’s modern waterfront.